Rhynchospora fusca (L.) Ait. f.
Rhynchospora fusca occurs in the Atlantic Coastal Plain region of northeastern North America, and less commonly in the Great Lakes region. The species also occurs in Europe. 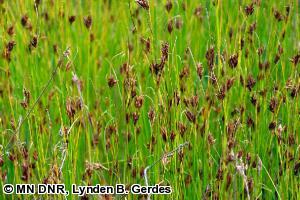 Rhynchospora fusca was first discovered in Minnesota in 1950 and initially believed to be restricted to water tracks in large, patterned peatland complexes. Although such peatlands likely contain some of the largest populations, the species has since been found in a variety of fen habitats including rich fens, poor fens, and shore fens. Less commonly, it has also been documented from sandy-gravel lakeshores. Populations range from a few individuals to 1,000's of plants. Nearly 90% of Minnesota's known occurrences of R. fusca are from the Arrowhead region of St. Louis, Lake, and Cook counties. Although difficult to determine what actually constitutes individual populations, it is estimated that around six-dozen populations have now been documented. However, the majority of these populations have not been revisited since their initial discoveries. Rhynchospora fusca was listed as a special concern species in Minnesota in 1984. The additional populations found through targeted rare plant surveys have added to the understanding and knowledge of the range and distribution of R. fusca. It is now known to be more common and widespread than once believed to be. Special concern status is no longer necessary, and Rhynchospora fusca was delisted in 2013. Crow, G. E., and C. B. Hellquist. 2000. Aquatic and wetland plants of northeastern North America. Volume 2. Angiosperms: Monocotyledons. University of Wisconsin Press, Madison, Wisconsin. 400 pp. Kral, R. 2002. Rhynchospora. Pages 200-239 in Flora of North America Editorial Committee, editors. Flora of North America north of Mexico. Volume 23. Oxford University Press, New York, New York.